This object from the Museum collection is a Maori mask brought back from New Zealand to England by Brevet Lieutenant-Colonel F.M. Colvile of the 43rd (Monmouthshire) Light Infantry in 1866. The 43rd (Monmouthshire) Light Infantry sailed from India, arriving in New Zealand on 11 December 1863. The Maoris greeted them with a mixture of welcome and hostility. There was conflict between the Maoris and the British, especially over land and the refusal of the Maoris to recognise the sovereignty of the British Crown. At the peak of hostilities in the 1860s, 18,000 British troops, supported by artillery, cavalry and local militia, battled about 4000 Maori warriors. Although outnumbered, the Maoris stood their ground against the British, occupying carefully placed fortified villages and underground bunkers protecting them from artillery fire. They were often able to inflict significant casualties on the British, yet quickly abandon their positions without significant loss to their own side. The 43rd were involved during their service in New Zealand in numerous skirmishes and battles in the vicinity of Tauranga, on the east coast of North Island, suffering a number of casualties at Gate Pah in April 1864. As an indication of the fierceness of the fighting, 13 Victoria Crosses were awarded during the 1863-66 Maori War, including to Captain F.A. Smith of the 43rd for an act of gallantry during an attack on a Maori position at Tauranga on 21 June 1864. Those who fought in the war received the New Zealand Medal 1860-66. The 43rd departed New Zealand for England in February 1866. Lieutenant-Colonel Colvile later became Colonel of the Regiment. 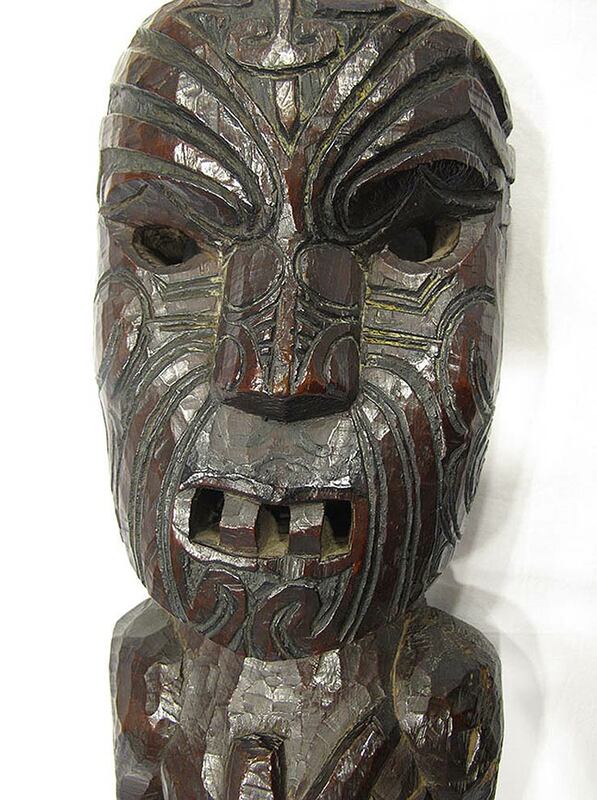 Maori masks were carved from one piece of light softwood by Maoris to honour their ancestors. The lines on the mask mirror Maori tattoos which traditionally Maori warriors had on their faces to make them look fierce. The masks often had beads or the like inserted in the eye sockets, which the mask in the Museum collection is lacking.